A variation on an increasingly familiar formula involving a Louisiana setting, voodoo or related magic, a star-crossed romance, and a protagonist conflicted about or unaware of her tremendous inherited powers. 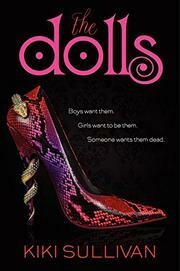 When Eveny Cheval’s guardian, Aunt Bea, moves her from New York to her original hometown of Carrefour, Louisiana, on her 17th birthday, Eveny immediately and inexplicably finds herself involved with a circle of uber-glamorous, impossibly gorgeous, privileged teens known locally as the Dolls. She begins to slowly understand that her connection to them involves a deep family history and some strong magic. But big questions remain, such as whether her mother really committed suicide all those years ago, where her father might be and what are the true motives of a certain gorgeous boy sending very mixed signals. Oh, there is also a society bent on destroying Carrefour and its magic, a threat that never feels quite authentic, probably because readers aren’t convinced that the main characters and their dubious way of life are worth saving. There are enough mysteries to keep the pages turning, though many will see the final bit of treachery coming well before the big reveal.